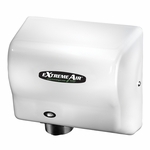 Dispenses commercially marketed all-purpose hand soaps within a vertical tank container. Features a satin-finish and soap refill window. Total capacity is 40 fluid ounces. Vandal resistant.